"Ice dams by Ron Hungarter, roofing and construction expert"
Roofers are not always to blame! If your home has a steep sloped roof, and is over twenty years old, a 98% probability exists that your attic has excessive heat, leading to ice damming, resulting in subsequent water damage, and may have other serious problems identified by that heat, too. Even newly constructed homes may have serious attic heat problems! Your response may be, "Oh, I do not live in a snow climate, so I do not have to be concerned about the heat that causes ice dams, right?" Wrong! Stop, look and listen. The problem of ice damming is a much deeper issue than may first appear and may be indicative of construction and health related problems other than just that of a "roof" problem, problems that can lead to delamination of the roof sheathing, wood rot of the roof rafters, failure of the insulation leading to higher fuel bills and the development of mold growth, creating health problems disguised as asthma, allergies, colds and sinus conditions. 6. And yes, let's not forget, the Homeowner, too! Architects and designers are constantly trying to create aesthetically pleasing new homes. However, beautiful but complicated roof designs are not always fully compatible with a variety of climates. In fact, complex roof lines create some distinct and intrinsic problems regarding dissipation of weather related issues, such as ice and snow. The above, newly constructed property has several incompatible, climate-related design problems, including the channeling of snow and ice from two portions of the large, main, intersecting roof line, down and onto the lower roof area, entrapping snow and ice between the sidewalls of the main house and the sidewalls of the dormer. Compounding this problem is the reduction of adequate ventilation capabilities, reduced by the lack of adequate soffit inlet ventilation air flow, thus allowing excessive heat build-up, further adding to the creation of ice dams. This roof displays classic snow-melt patterns of unsatisfactory attic ventilation. However, other unsatisfactory conditions, leading to excessive attic heat, resulting in ice damming, were also present and will be discussed. A closer look at this dormer reveals a very large, steep intersecting roof, emptying it's snow load and ice melt down onto the lower roof space, which is then entrapped by the dormer sidewalls. Note the ice dams forming at this dormer. The snow melt pattern of this roof is a distinct indication of excessive, unwanted heat in the attic space. Note the spike of white snow along the rake, outside the living area. The "rule-of-thumb" is that properly ventilated attic air should never be more than 15 degrees hotter than the outside air. If it is hotter, then that is an indication of additional heat sources that should be eliminated, and/or an indication of unsatisfactory attic ventilation that must be corrected immediately. Snow melt of an attic without excessive heat build-up and with functional attic ventilation should be totally and uniformly white. If the snow melt were the results of heat from the sun, all of the roof would be clear, without any white spikes being present! 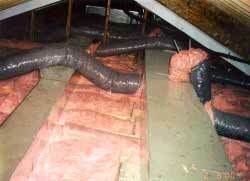 Attic heat is the enemy of all roofs, and poses a problem for the insulation, h.v.a.c. systems and health factors, too. How does heat enter the attic? How does heat exit the attic? These are two very important questions that must be asked of and answered by every construction design, whether it is for new construction, for additions, or for renovations. Without heat, there are no ice dams, no moisture condensation problems and no health issues! The following are pictorial examples of some ways unwanted heat enters the attic space and some reasons why heat can not exit that attic space, too. Each of these conditions attribute to additional heat, the ultimate enemy of a healthy home. You are standing in the attic, looking down into the open space around the framed box of a living room fireplace. Talk about heat!?! This is a major heat source, open directly into the attic space due to unsatisfactory construction and is a major problem for the creation of ice dams. Other heat problems exist, too. Look closely at the gray area in the photograph, which is the back of the drywalled walls. No insulation! Therefore, even when the fireplace is not in use, excessive heat is still entering the attic through the uninsulated walls. This home, located in the northeastern USA, will have huge utility bills for heating and air conditioning. When constructing the addition of another home, only limited space was deemed available to install the h.v.a.c. system, so it was installed within the attic space. Big mistake! Aside from the very difficult access for monthly maintenance, the low sloped roof eliminated air spaces above the furnace, further enhancing heat build-up in the attic, leading to snow melt and ice damming. The silver image at the top, center of this photograph is a full-sized, natural gas-fired, forced hot air furnace. 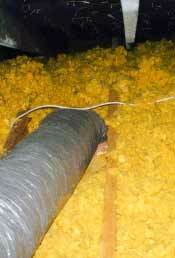 Excessive flex ducts allow additional unwanted heat to enter the attic space. The bottom, center of this photograph reveals a "typical" gap in the pink insulation, allowing another unwanted heat source to enter the attic from the living space below. Ice dams were inevitable. Note the classic snow melt pattern, also seen on the home discussed above. Compounding this design problem even further, when the addition was installed, the entire house was re-sided. However, the original wood-covered soffit overhangs were never removed before installing the new perforated soffit vents, thus eliminating inlet air flow to the attic, an important and necessary element for all healthy homes. The new addition had open, perforated soffit vents installed, but were then covered with insulation, eliminating needed and necessary inlet air flow to the attic. Soffit vent protectors were not utilized and should have been installed to help avoid insulation from blocking these vents. The pink insulation was not installed according to specifications, and was out of position, allowing heat to enter the attic from the living space below. 12" of insulation, creating an R-38, is optimal. Remember, only have one vapor barrier and install it facing down to the heated surface. 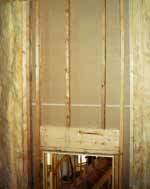 If additional layers of insulation are needed to attain 12", use either unfaced insulation or blown-in insulation. This is a close-up of an ice dam. 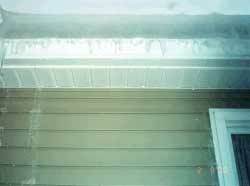 The white, vertical lines on both the left and right sides are frozen water that had infiltrated this home and then froze again when exiting through the siding weep holes and soffit vent holes. the electrician! Yes, the electrician installed a "standard" recessed lighting fixture in the master bedroom ceiling for use as a reading light over the bed. However, when the light fixture was utilized with snow cover on the roof, additional heat was generated in very close proximity to the low sloped roof, causing pre-mature ice melt and ultimately an ice dam. The roofer did not stand a chance! 2. Insulation that is extended out over the soffit inlet vents, completely eliminating critical inlet air flow. Air flow is easily explained using a catsup bottle as an example. When you open a new bottle of catsup and turn it over, and the catsup does not come out, do you know why? Because in order for the catsup to exit the bottle, air must enter the bottle. The same scenario holds true for your attic. 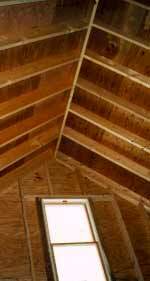 In order for heated attic air to exit the attic, make-up air must be able to enter the attic. Having "only" inlet vents, or having "only" outlet vents is as good as having "no vents" at all! You must have both, inlet and outlet vents and in a balanced proportion, too. "Professional Roofing" magazine, published by the National Roofing Contractors Association (NRCA), had a very good article in their Residential Essentials section, entitled, "Ventilation guidelines", found on page 55 of their June, 1999 issue, for reference. 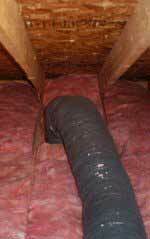 Many web sites discuss the importance of attic ventilation, too. Insulation is designed to keep heat within the living space in winter. All sidewalls facing an unheated surface must be insulated, with the vapor barrier facing the heated surface. Attic air space should be considered unheated space. Thus, all walls adjoining that space must be insulated to help reduce heat entry into that attic space. Shown in this photograph is an attic stairwell, with a large, uninsulated side wall above the entry door, leading to the unheated attic space. This particular newly constructed home had excessive ice dam leakage and water damage, with the owners demanding that the roofer shovel the snow off of the roof, which he did. Oh, by the way, doors leading to unheated spaces should be addressed and trimmed as if they were outside doors, complete with saddles and weatherstripping. Remember, heat, not the roofer, is usually the culprit in creating ice dams! Another common, but unsatisfactory practice, allowing heat to enter the attic, involves installing bathroom exhaust vent duct into the soffit vents, rather than correctly installing the duct to an outlet vent. Hello! Soffit vents are inlet vents, not outlet vents! Everything that exits the house at a soffit vent immediately re-enters the house in the attic space, because that is what soffit vents do, they bring in outside air flow. Not only will this add heat, but it will also add humidity and moisture to the attic, defeating the very reason for installing the bathroom fan in the first place. This is a Real Problem! 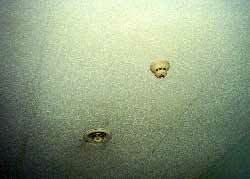 Even a home with functional attic ventilation can now develop molds on the roof sheathing cavities above these unsatisfactory ducts. Now you have no air flow, added heat and added humidity in a dark, moist environment. Not good! Because, now you have created the perfect medium for mold growth - dark, moist, heated space. Specifically, black mold, which spreads by spores, and for which there is growing new evidence of serious health hazards associated with breathing in the black mold spores, articles about which can be located on many web sites, has been found in 80% of the homes I have inspected over the years, both new and old! In fact, my own doctor called me to inspect his "dripping wet attic" of his brand new home. Concerned about low humidity, he had the central humidifiers cranked to the max. Unfortunately, his builder also had minimal ventilation. The consequences - wet roof sheathing covered with heavy black mold that his family members were allergic to! The black area above the yellow insulation in the photograph is not black due to a lack of light. It is actually blacked by heavy black mold growth that is a serious health and safety issue for mold-susceptible people such as myself! This is an unhealthy home syndrome that must be corrected immediately. Remember, just because you are not allergic to molds today does not insure that you will not be allergic to molds tomorrow! If you are experiencing breathing and allergic type reactions, contact your doctor and then call someone to have your attic inspected for proper insulation, ventilation and heat sources. Even further compounding the very unsatisfactory conditions of this attic is the use of loose, blown-in, fiberglass insulation, lacking a vapor barrier, which now doubles the amount of attic ventilation needed. Normally, the ratio of net free-air vent space to attic floor space being ventilated is 1/300, meaning that for every 300 square feet of attic floor space, one square foot of net free-air vent space must be provided. However, that ratio of required vent space now doubles to 1/150 for this type of insulation. Now you have a double whammy on the living conditions of this home! Oh, and let us not overlook the heating duct near the roof line, too, which also adds additional heat... there is that word again... heat! You now know what not to do to create unwanted attic heat. Let us now discuss things to do to get rid of unwanted and damaging attic heat. First, to avoid ice damming and the other problems, confirmed that every steep sloped roof has continuous soffit inlet vents. However, many homes designed and built in the 1950's were constructed without any soffit overhangs, making the installation of conventional soffit inlet vents impossible. Fortunately, the importance of attic air flow, even for homes built without soffit overhangs, is now becoming better understood. There are many new products on the market that will provide inlet air at the eave of the roof by bringing in the air from behind the gutters, through the roof sheathing, and under the shingle materials. Both roofing and carpentry work are required to install these new inlet vents, which are available wherever most roofing materials are sold. Second, you must have ample outlet vents in the form of either 9" roof vents, or gable end vents, or ridge vents. Since heat, the primary culprit, rises to the peak of the roof, the logical outlet vent should be located at the peak of the roof, were an opening to the outside would then let unwanted heat exit, quickly, easily and efficiently, thus eliminating many problems. However, a closer look at the interior attic space of this newly constructed, three hundred and some thousand dollar home, reveals absolutely no outlet vents whatsoever! This is unsatisfactory and a disaster waiting to happen. Unfortunately for this newly constructed home and the new homeowner, it did, too and with major damage consequences! This new home had no ridge vents on this portion of the attic, with only a very, very small gable end vent installed. It was an ice dam waiting to happen. Oh, and if your home does have gable end vents or standard roof vents, please do not cover them with plastic during colder weather, thinking that you are saving heat! Doing that is the equivalent of "smothering" your home's breathing capability and you know what happens then...?! Caution, just because you see a ridge vent on the outside of your roof does not mean that it has been properly installed underneath! Most manufacturers of ridge vents, including all of the major shingle manufacturers, require almost a 2" cut away on each side of the ridge board, the reason it is called a ridge vent, to allow for the proper and needed amount of net free-air vent space to work properly. Unfortunately, many homes do not have their vents properly and correctly installed. This new home's ridge vent installation was unsatisfactory, noting that the roof sheathing was not properly cut away and removed. Other portions of this roof's ridge vent had both felt paper and shingle materials covering the opening, thus reducing exiting net free-air flow. Without exits for attic air, heat builds up, melting snow, creating ice dams and causing many other problems, too. This porch roof still has almost a foot of snow on it because there was no heat source under the "open" porch to cause snow melt. The main house roof should have looked the same. If your home has snow melt patterns noted above, then you have at least one or more of the above problems that must be addressed immediately to maintain a healthy home and a health you, too! Winter is just around the corner. Correcting the above problems is easy during warm weather, but almost impossible to correct in cold weather. So, act now. If your home has experienced any of the above scenarios, start now to correct these problems before they become bigger problems. "A stitch in time saves nine." Oh, about power vents - many times they won't do the trick. They are thermostatically controlled and thus do not work in the winter, when it is actually more important to ventilate your attic. When insulation gets wet, it loses some of its "R" value or resistance to thermal exchange, thus increasing the work required by heating and air conditioning systems. I have seen many a home look like a scene right out of "Dr. Zhivago's" Ice Palace! Tip: If you do have an attic h.v.a.c. system, be sure to periodically clean out the overflow trap for the air conditioning pan. These devices tend to block up, causing the pan to overflow and cause ceiling water damage, mimicking a roof leak. Once again, the innocent roofer gets the blame! After reading all of this data, you may say, "All I need is one of the many self-sticking ice and water barriers installed with my roof to eliminate ice damming." You would be right. This material eliminates water infiltration through the roof in most cases. However, I have also been addressing conditions related to the "inside" of the attic space and addressing other problems which will still occur even with the installation of expensive self-sticking barriers. As a cold hard fact, if you do not have excessive heat in the attic, you do not need this expensive material. Unfortunately, most homes have excessive heat and now, most roofing manufacturers are insisting on the installation of self-sticking barriers, too. In 1992, while still doing general contracting, I renovated an older, plank-constructed home for a client, including the installation of soffit vents, ridge vents and 12" of fiberglass attic insulation. In 1993, the northeastern USA had record snow fall, record cold weather and winter rains. My client was the only one in her neighborhood who had "zero", "nada", "no" ice dam leakage and no water damage that winter! Period. Closing comment: In July, 2000, I was in the Columbia County Courthouse, Bloomsburg, PA, acting as an expert, defending a good roofer against alleged improprieties in his re-roofing installation. This case involved a job that had excessive heat due to no soffit inlet vents and no outlet vents of any kind, creating unsatisfactory attic ventilation (the lack of which was demanded by the owner, apparently under the misguided impression that vents cause heat loss and higher fuel bills??? ), had many large insulation gaps and openings, had an unsatisfactorily installed bathroom vent, and had an h.v.a.c. system in the unventilated attic, which had never been serviced, allowing overflow water leakage onto the ceilings below! This roofer is not to blame! �2000-2011 Ronald C. Hungarter. All rights reserved.